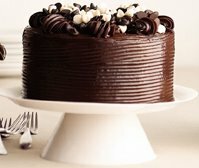 you have Manu for valentine day?, I have delicious Manu for diner is Fantastic Chocolate Cake. It's easy! Preheat oven to 375 degrees. Sift dry ingredients into 8" square or 9" round baking pan. Mix liquids (except vinegar) and whisk into dry. When batter is smooth, add vinegar and stir quickly, until it is evenly distributed. Put it in the oven, don't let it stand around (that has something to do with the vinegar) Bake for 25-30 minutes...or longer until done. This cake is great served with Provamel's soya dream (cream like).